• Weakening of control over their reactions, loss of attention and memory. However, we know that many people to old age retain their personal characteristics and creative possibilities. Note that the degree of regression of memory and intellect depends on the initial quality of these functions at a young age, as well as exercises in their lifetime. 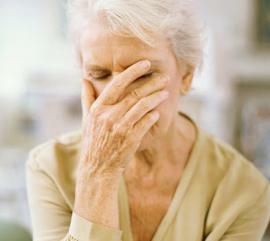 In old age, depression is is more often observed with prevalence alarming of anguish, suspense, anxiety. Often accompanied by a state of guilt, self-blame, devastation, impoverishment. Often there hypochondriac delirium, reaching the level of delusion Cotard (think that they have inoperable cancer, a tumor). Suicidal Tendencies such patients are very dangerous, because there is no psychomotor retardation, patients carefully think through the way of suicide, which is then completely unexpected to others. Quite often there are multiple senesthopathia that leads to hypochondrial. Depression are often wear protracted nature and last for years and are difficult to treat with antidepressants. Sometimes it is necessary use ECT. 1. Dementia of the Alzheimer type. It is the most common type of dementia. Most suffer a woman. At the basis - diffuse cortical atrophy, with mainly affecting of the temporal and parietal lobes. Perhaps early (45-65 years) and late onset (65 years). Symptoms: memory loss, impaired spatial orientation, intelligence, disorders instincts, emotions, the total dementia. 2. Multi-infarct dementia. Due to multiple infarcts in the brain. Is developing by the cerebral atherosclerosis. It is more common in men. The average age of 50-65 years. Symptoms include headaches, dizziness, tinnitus, fatigue, emotional lability, memory impairment, fixation amnesia, Korsakov's syndrome. 3. Dementia due to other causes (infections, metabolic disorders). Cere (In violation of cerebral circulation). The states of vascular confusion.